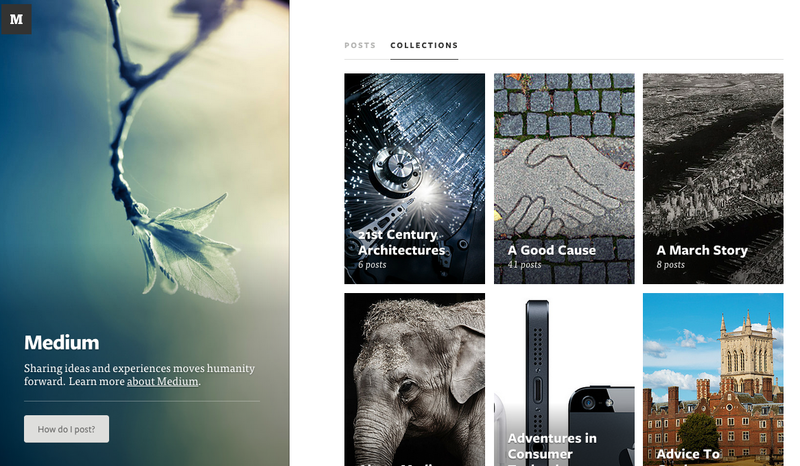 @Medium – The Next Big Thing in Content or a Snobbish Exercise in Self-Gratification? Medium is not yet a fully launched or fully defined content platform but is popping up in all of my online reading places. When you check it out, it is distinctly clean, simple and minimal—no extra links, cute photos, too much sharing or navigation options. What is supposed to make you stay on the page is what is written on it. And the contributing writers are very, very impressive – Steven B Johnson, Sarah Doody, Felix Salmon, to name a few. In the world of busy Facebook, WordPress, Tumblr and BuzzFeed, Medium is like a breath of fresh air. It is also very, very annoying in its current form. Medium is organized in collections. The person that creates the collection can decide if others can contribute to it. Yet there is no way to search for collections, or authors. If you happen to stumble upon an article you like you can click on its author and see his/her other posts and collections. For example, I found out that Steven Johnson is a contributor from a tweet of his. If I had not stumbled upon that (it is not like Twitter is designed to help you never miss anything), there was absolutely no way for me to know that Johnson was a contributor. Who else is writing for Medium? I don’t know and it is not possible to find out. I am sure that Medium’s goal is to encourage visitors to immerse themselves in the content rather than jump around too much and to an extent it is succeed. But Medium should not be doing that at the expense of readers’ ability to find what interests them. Even in a library, this old fashioned mausoleum of slow reading and serendipity, I can search for the books I want. That seems to be what Medium is trying to do with the persistent “How Do I Post” button. It follows you on every page, taunting you to ditch whatever inferior platform you are using for your blogs and become part of this elite writing community. You click it and then you are slapped in the face with the snotty “Creating new posts and collections will be open to everyone soon.” There is nothing wrong with not giving everyone permission to post this early. And the question about how you can post is important. But if you are not ready to give people access, do you really want to ask them on every single page if they want it? As every parent will tell you, if you are out of candy, you do not ask your kid if they feel like chocolate. If that is not frustrating enough, try to find information about the site. To get to About Medium, you need to click that same How Do I post button. The FAQ page has a list of questions, but most of them are NOT answered on the page. Instead you need to click a link to a blog post that answers each specific question. And guess what, there is no breadcrumb navigation to take you back to the FAQ page. In short, if I have a question about Medium, I need to take at least four steps to get to an answer, and the only entry point is through the “You want some chocolate? Too bad!” button. To be fair, the site is still in closed beta and as many online entrepreneurs will tell you, it is a challenge to find the right balance between features you want to show early and get people excited about (great writers! minimal distraction!) and the ones that you are fine-tuning to work flawlessly before you unveil them (scale, search). I still love the idea and believe it has a huge potential to become a destination for thoughtful content. But until the official site is launched, I will only visit Medium when I think that my self confidence needs to be taken down a notch. Note: The use of literary quotes undoubtedly qualifies me for a beta contributor. 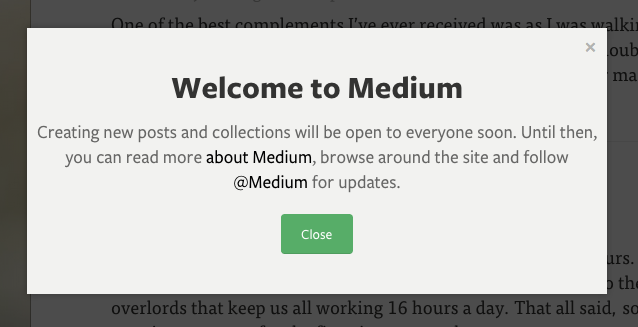 Should this happen, I reserve the right to change my opinion of Medium and re-center on its brilliance.